Currently water planning in Central Texas carried out by two major groups of stakeholders. One group is organized along river basins and includes the Lower Colorado (Regional K) and Brazos G (Region G) Water Planning Groups. The other is organized around the Carrizo-Wilcox major aquifer and known as Groundwater Management Area 12 (GMA-12). GMA-12 is made up of five groundwater conservation districts (GCD) including Lost Pines GCD. Another group is expected to be appointed in 2009 and is organized along river and bay systems for the purpose of establishing the environmental needs of surface waters (Colorado & Lavaca River and Matagorda & Lavaca Bay Environmental Flows Stakeholder Group). Bastrop County is in the Lower Colorado RWPG. The Region K planning group supports the legislative mandate that give groundwater conservation districts (GCD) the ability to modify the rule of capture in order to preserve groundwater quality and quantity but recognizes the authority of the rule of capture in locations where no GCD exists. 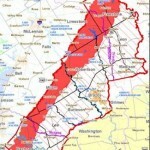 The Lost Pines GCD has jurisdiction over the groundwater in Bastrop and Lee and contributes to Region K and G planning. The Lower Colorado RWPG supports the management of groundwater resources at the sustainable level wherever possible and has established the sustainable use of groundwater resources as a policy for the region. Sustainability is defined as balancing groundwater withdrawals with natural recharge and replenishment to maintain long-term stability in regional or local groundwater supplies. The available groundwater estimates of the Carrizo-Wilcox aquifer in Bastrop County is taken from the Lost Pines GCD Management Plan. The availability in Fayette County is taken from the Fayette County Groundwater Conservation District Groundwater Management Plan. Both Lost Pines and Fayette County GCD are in Groundwater Management Area 12. Much of the driving force behind plans to over-pump the groundwater resources of the Carrizo-Wilcox aquifer come from Region G planning. 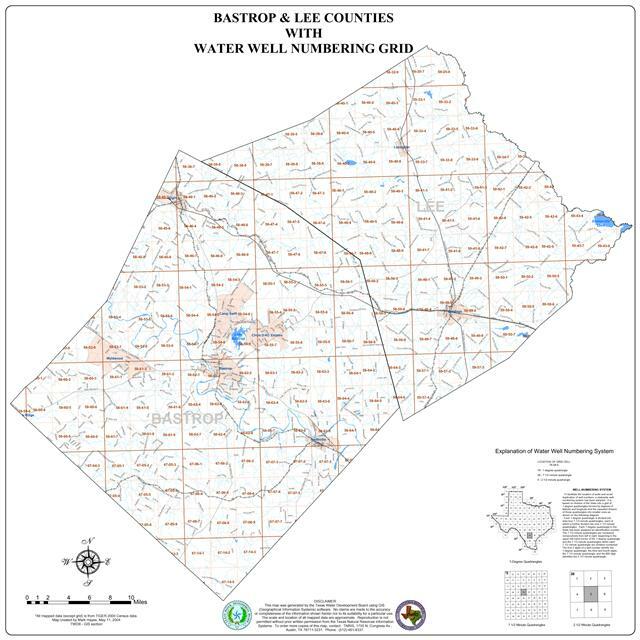 Lee County is adjacent to Bastrop County and is in the Brazos RWPG and Groundwater Management Area 12. 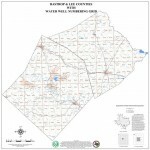 The Lost Pines GCD has jurisdiction over the groundwater in Bastrop and Lee and contributes to Region K and G planning. Region G is planning to obtain 42% of its estimated groundwater needs from Lee, Milam, Burleson, Brazos, and Robertson Counties; far in excess of sustainable recharge of this aquifer group. Overall the five counties are expected to contribute 225,000 ac-ft/yr of groundwater. The Brazos RWPG has opposed the Lost Pines GCD assessment of available groundwater and has over-ridden (under protest) their estimate of 7,500 ac-ft/yr and established 45,000 ac-ft/yr as the estimated available groundwater from the Carrizo-Wilcox in Lee County. Likewise, they have used 45,000 ac-ft/yr estimates for each of Milam, Burleson, Brazos, and Robertson Counties. These estimates greatly exceed the recharge of the aquifer in those counties which are estimated at 7,500, 31,600 and 13,300 ac-ft/yr in Lee, Milam and Burleson Counties and 19,000 ac-ft/yr in Brazos and Robertson Counties; a total recharge of about 71,400 ac-ft/yr, a 153,000 ac-ft/year gap between recharge and demand. Region G took the action of over-riding the Lost Pines GCD in order to “obtain a determination of administrative completeness from the TWDB” and is not supported by GAM runs or other quantified studies. The other counties that are not within a groundwater district include: Falls, Limestone, Navarro, and Williamson. For these counties, the Judge is the contact point for participation in the process because counties have the authority to establish county subdivision rules that can have groundwater management implications. 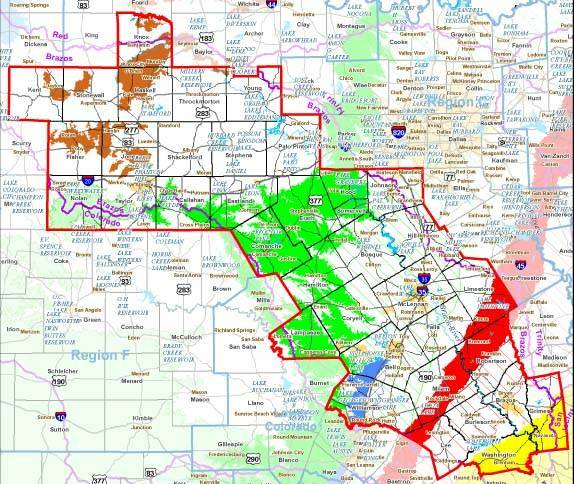 The Lost Pines Groundwater Conservation District (LPGCD) was created by Senate Bill 1911 in 1999, ratified by House Bill 2432 in 2001, and confirmed by general election vote in Bastrop and Lee Counties in November 2002. 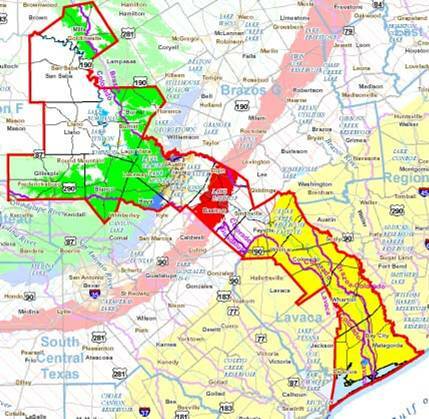 According to the LPGCD website and management plan dated September 15, 2001, the District was created to protect the water supply for the residents of Bastrop and Lee Counties, Texas, and that is its sole mission. 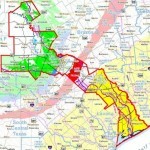 Under Texas law, a water district is the only tool available to protect our groundwater supply. In fulfilling its mission, the LPGCD’s management plan establishes the intent to endeavor to maintain the aquifers in the District on a sustainable basis; “sustainability” means to develop and use groundwater in a manner that can be maintained in perpetually. In August of 2000 Dr. Robert S. Kier published “Lost Pines 2000 Aquifer Evaluation,” a report that evaluated the impact of then proposed production of 55,000 acre-feet per year of water from the Carrizo-Wilcox Aquifer for delivery to San Antonio as proposed in the Region L Water Management Plan. The study concludes that “extensive ‘dewatering’ of the Simsboro Aquifer would begin before the year 2040 if the proposed production for San Antonio occurs. Over time, the 55,000 acre-feet/year, in addition to other projected pumping in the area, would result in reduced artesian pressure, lower well water levels, and ultimately ‘dewatering,’ or ‘mining’ the aquifer – that is, the level of water in the Simsboro Aquifer would drop below the top of the aquifer”. Fortunately the contact for this activity was cancelled and the plans have not gone forward. However, demand for this amount of water still exists in Region K and G.
According to the LPGCD’s management plan, “groundwater supply issues are relatively simple and straightforward, though potential solutions are not readily apparent. Looking solely at the total amount of water within the Carrizo-Wilcox Aquifer, there is approximately 235 million acre-feet of water in storage. In addition, there is slightly more than one million acre-feet of water in artesian storage and the existence of artesian storage is critical because it is the pressure associated with this artesian storage that drives the natural behavior of the aquifers, most particularly the discharge of groundwater to surface water courses. Artesian pressure also likely influences the overall quality of water in the aquifers”. 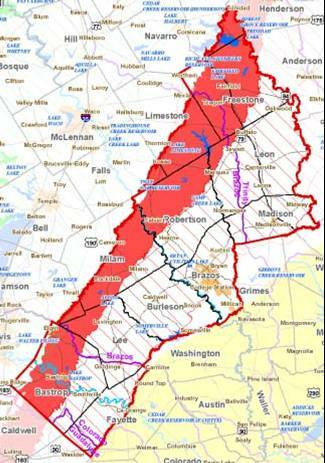 As stated in the management plan, the LPGCD recognizes that “some temporary decline in artesian pressure must occur for groundwater to be produced, ,,, “ and further states that “a long-term, continued reduction in artesian pressure is not in the best interests of the citizens and businesses in Bastrop and Lee counties, which depend on groundwater for a potable water supply. This fact, coupled with the limited amount of potentially usable natural recharge, restricts the amount of groundwater that can be withdrawn from aquifers within the District without potentially adversely affecting artesian pressure, water levels in the aquifers, and the amount of groundwater contributing to the base flow of the surface water courses” (emphasis added).